To fill an important gap in non-profit fundraising information, Penelope Cagney and Bernard Ross, went about compiling and editing pieces contributed by leading fundraisers across the world. 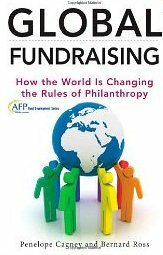 The result is "Global Fundraising: How the World is Changing the Rules of Philanthropy", published by AFP and Wiley. The book covers fundraising across countries, regions and continents. Each chapter highly derives on local contributions from fundraisers in respective geographies. In other words, it is collective wisdom, which is not very often available publically in the field of fundraising.